This looks like a small passerine. A bluebird comes to mind but our quiz bird lacks rufous or blue in its plumage. Our bird looks a little like a swallow but all swallows have very long primaries which our bird lacks. How about a flycatcher of some sort? The shape and proportions certainly look right. Our quiz bird lacks yellow, olive, or rufous so we can eliminate the Myiarchus, the Empidonax, and a couple of the kingbirds. Pewees have bolder wingbars, a longer primary projection, and aren't as pale on the underparts. An Eastern Kingbird would have a larger bill and show more contrast between the dark upperparts and the white underparts. How about a phoebe? This obviously isn't a Say's Phoebe but the small bill, short primary projection, weak wingbars, and whitish underparts work fine for an Eastern Phoebe. 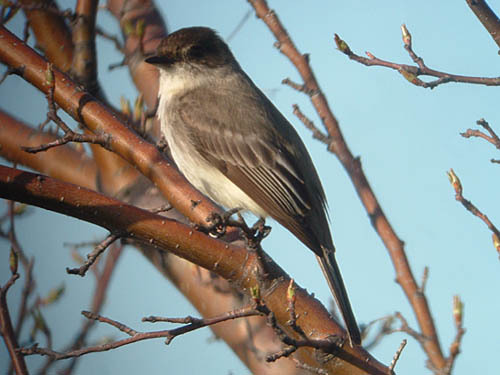 This Eastern Phoebe was photographed at Montrose Point in Chicago on March 29, 2004.